Heat the oven to 400°F. Lightly spray a baking sheet with vegetable cooking spray or line it with parchment paper. Stir 1 egg with the water in a small bowl with a fork. Place the almond paste, granulated sugar, remaining egg and vanilla in a food processor. Cover and process until the mixture is smooth. Unfold the pastry on a lightly floured work surface. Roll the pastry into a 12 x 10-inch rectangle. With the short side facing you, spoon the almond mixture on the bottom half of the pastry to within 1 inch of the edges. Cut several 2-inch long slits, about 1 inch apart, on the plain side of the pastry. Fold the pastry over the filling and seal the edges with a fork. Brush the pastry with the egg mixture. 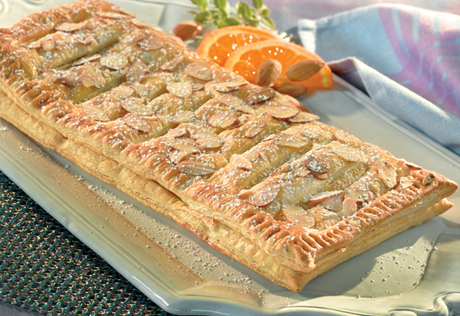 Sprinkle with the almonds and place the filled pastry on the prepared baking sheet. Bake for 12 minutes. Reduce the temperature to 375°F. Bake for 20 minutes or until the pastry is golden brown. Cool on a wire rack for 15 minutes to serve warm or let cool completely. Sprinkle with confectioners' sugar, if desired.